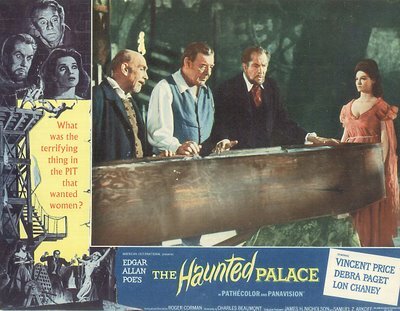 Had I been called upon in the spring of 1964 to name the greatest motion picture ever produced, my answer would certainly have been Roger Corman’s The Haunted Palace. 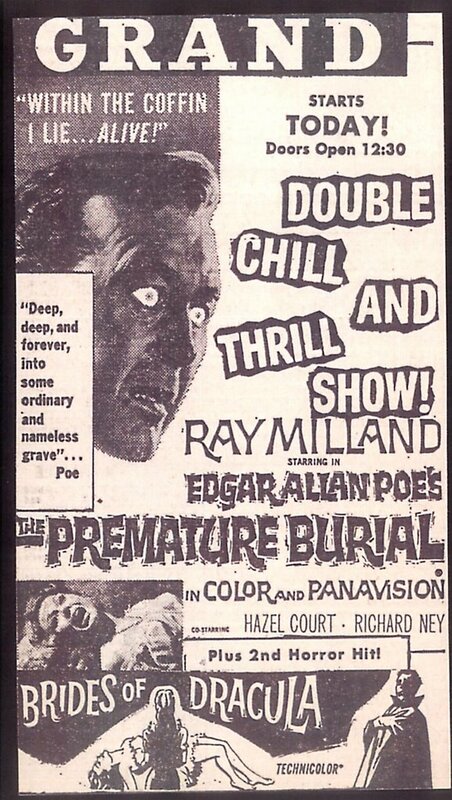 Not that I’d have given him a possessory credit --- at that time, I didn’t know Roger Corman from Mr. Dill Pickle, but it wouldn’t be long (only months in fact) before I would recognize that name in the many Poe adaptations he directed. My childish delight in the Corman/Poes (and I still love ‘em) drove me toward a sixth-grade commitment to social activism peculiarly suited to those turbulent days of sixties upheaval. At a time when our country was being torn apart by Viet Nam and civil unrest, I was distributing a petition among my classmates. Bring Back The Haunted Palace! was our demand, and it was these incendiary words, bearing the signatures of at least twenty-five largely indifferent twelve-year olds, that I flung into the face of the Liberty Theatre’s management that day in 1966. My entreaties on this account were no more successful than my efforts at persuading Colonel Forehand to bring in the Dr.Evil stage show (I still say that would have been a sensation!). It would be eleven long, tormented years before I would see The Haunted Palace again. By that time, it wouldn’t even be my all-time favorite movie anymore. Now why this senseless, self-indulgent rambling on an otherwise peaceful and uneventful day? Well, because this is no ordinary day for starts. It’s Roger Corman’s birthday --- and he’s eighty, which is cause for celebration among a lot of fans who were raised on the countless pics he’s produced and/or directed over five decades plus. Video Watchblog’s Tim Lucas called for a commemorative blog-a-thon just yesterday, so we’ve had to hustle up these images to get in on the web gala (by all means, head over to Tim’s site HERE for more Corman). There’s no way any of us can cover Roger’s entire career in a single posting, so my own humble effort will focus on my favorites among his oeuvre, the Poe series. American-International topper Sam Arkoff used to describe the Poe thrillers as studio evergreens. Indeed, this was one group he strenuously withheld from TV release. It would be December of 1970 (or was it ’71?) before Pit and The Pendulum became the first Poe to appear on a network. Sam always said he could sell these things to drive-ins in near-perpetuity. My own research suggests he was right. Here’s a statistic from Greensboro, NC in 1964 --- Tales Of Terror played six separate times, often bouncing back-and-forth between drive-ins and hardtops within the same week --- Premature Burial had four runs that year. Not so extraordinary in a large city, perhaps, but this was a mid-sized town of under 140,000 at that time, and both movies were going on two years in release. The way Sam tells it, the exchanges never discarded a print. Instead, they would cannibalize usable reels and assemble complete features, enabling two worn and splicy prints of, say, The Raven, to eventually become one slightly less worn and splicy print. This kind of salvage operation made it possible for American-International to keep these Poe titles in service for many years. An exhibitor friend of mine recalls playing Premature Burial at his drive-in around 1977. The 1962 Pathecolor print had already turned pink, but by that time, and for a flat rental of no more than $20, no one was complaining. 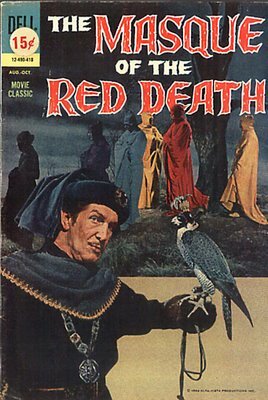 Outdoor theatres could still pack the lot with dusk-to-dawn Vincent Price Poe marathons --- five features end-to-end --- and the total film rental was probably less than $100 total. No wonder these pictures played non-stop for so many years. 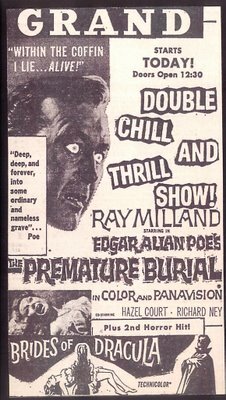 The Poe series was a major profit center for AIP as long as the vogue lasted, and Roger Corman was in for the first eight of them. 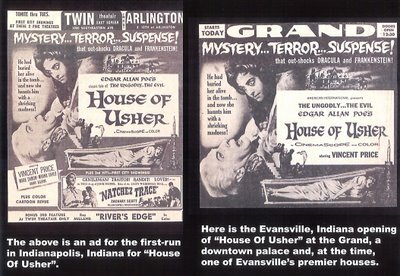 House Of Usher garnered $1.4 million in domestic rentals, a near-record AIP number exceeded only by that year’s Goliath and The Barbarians (! ), which did $1.8. Pit and The Pendulum was slightly better, and captured a whopping 13,627 bookings, more than a lot of major studio features were getting. American-International really knew how to push its product back then, and they worked hard at good exhibitor relations. 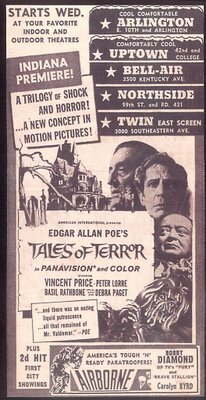 Tales Of Terror was the first one to fall below a million, but Corman’s comedy approach with The Raven got good word-of-mouth among the kids, and the rentals spiked to $1.2. After that, it was a slippery slope. The Haunted Palace was down to $797,000 --- Masque Of The Red Death tumbled further to $535,000 --- and Roger’s last, Tomb Of Ligeia bottomed out at $348,000. Bookings for Ligeia were less than half in number to those of Pit and The Pendulum. It was a great series, but as Sam Arkoff often pointed out, when a thing has run the course, bring down the curtain. Poe was back with AIP within a few years, but these were stand-alone features from new directors, and stylistically very different from Roger Corman’s formula. After years of wandering amidst faded 16mm prints and cropped TV runs, the Corman Poes were finally reborn, first on laserdisc, then on DVD, where they can at last be seen in something like their original incarnations. Roger himself has provided informative audio commentaries, and it’s great to see (and hear) the venerable maestro accompanying these high-quality releases. I saw The Haunted Palace in a double feature with 20,000 Leagues Under the Sea back in 1963. I was freaked out by those people with skin over their eyes. The film made such an impression on me that I also started reading H.P. Lovecraft a few years later. I saw The Haunted Palace again theatrically at the Corman retrospective that I mentioned and again on cable. My childhood movie-going experiences would've been calamitous sans Corman films; I may have been forced to go see Disney pictures. What I appreciate about his early shockers is that they delivered the goods: by God, you've got a crab monster in ATTACK OF THE CRAB MONSTERS (well, one anyway), a wasp woman in THE WASP WOMAN, and IT really did CONQUER THE WORLD for a brief time, anyway. Compare that to CURSE OF THE CAT PEOPLE, folks. 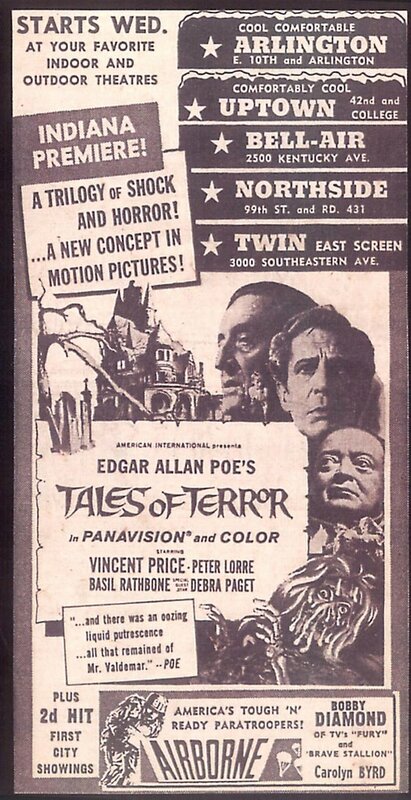 As for the Poe series, well, those played in downtown Akron's Colonial Theatre, the showplace of the Rubber City (now it's the Parking Lot of the Downtown Area, of course) and I thought HAUNTED PALACE was the most terrifying thing I'd ever seen. Saw TALES OF TERROR and THE RAVEN and MASQUE OF THE RED DEATH there, too, over the years, but I was too young for the earlier films and I guess by LIGEIA interest had waned in my family, too. Oh, and saw COMEDY OF ERRORS there, which was neither Poe nor Corman, but we didn't know the difference and always considered it "part of the series". So, do you have domestic figures for THE PREMATURE BURIAL, the only one in the series sans Vinnie Price? Hi Gravy --- Always great hearing from you! Yes, I do have those numbers for "Premature Burial" --- it did $1.076 million in domestic rentals, with 11,981 bookings through August 13, 1983 (and I'll bet they were still getting drive-in action right up to that day!). I am glad to see others who share my fondness for the Corman/Poe films. There is a special joy I get when I see the titles in that typeface they used (anyone know its name?) and the various matte paintings of haunted mansions and castles and of course Vincent Price! I showed those films a lot in 16mm at my High School and at college and they were always crowd-pleasers. 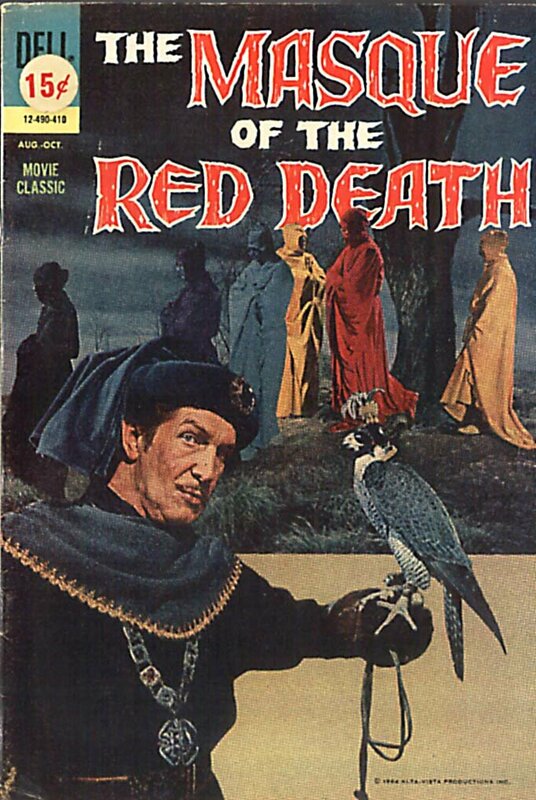 Oddly enough the two shot in England (MASQUE OF THE RED DEATH and TOMB OF LIGEA) were the least favorite. Even TALES OF TERROR (the three story one) was more popular. 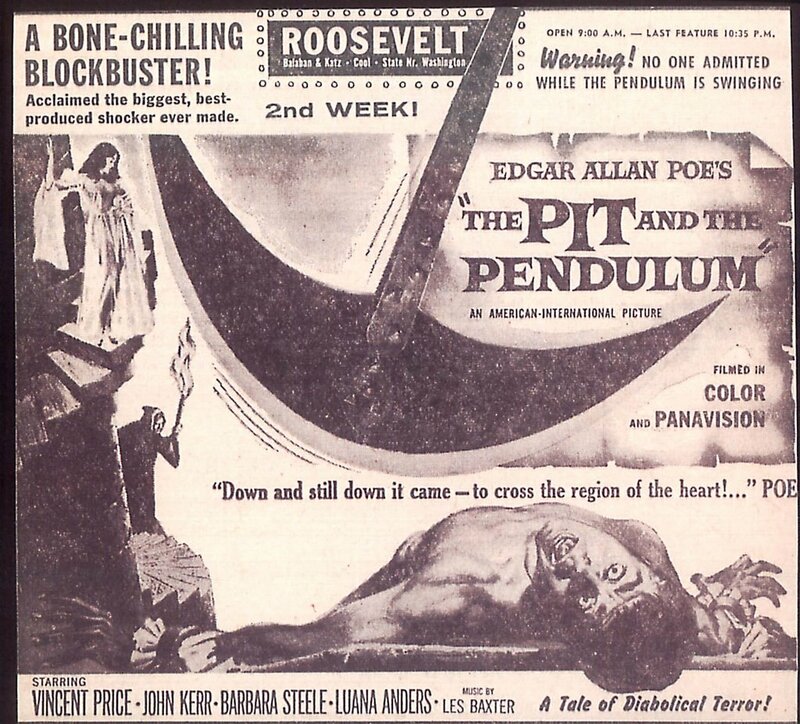 When the matte painting from PIT AND THE PENDULUM turned up in LOVE AT FIRST BITE (as Castle Dracula) it got applause. 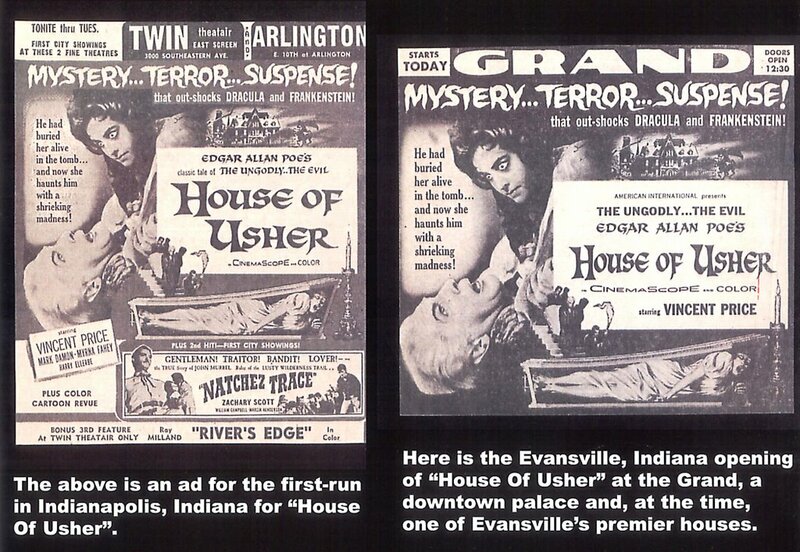 Apparently even general audiences remembered the Poe films fondly. Great post. Being an Indianapolis resident, I really love the Indy ads. The Arlington theater listed in several of those ads is an Ace Hardware these days. It was a live music venue, as several old theaters in Indy ended up before being torn down. I guess it made out better than the Twin which is long since gone.